We leave the decoration of public space to others. The city, not us, puts up bus stops and rents out billboards on those bus stops. It plants trees and strings them with lights in the winter. In summer, building owners plant flowers and put out flags. We don't. We walk through, minding our business, occasionally glancing around. Picking up garbage on the street that you yourself did not drop is practically an unbalanced act. Planting a tree on the public way is probably a misdemeanor of some kind. Occasionally an individual will embellish a public space -- those memorials you see on highways marking where people have died in road accidents, whitewashed crosses and teddy bears and displays of sad plastic flowers. It shows just how reluctant we are under normal circumstances to project ourselves into the public sphere, that it requires a terrible tragedy to move someone to decorate the side of the road. Most folks, that is. Artists, however, take a different relationship to common space. Enjoying the freedom that creativity brings, and a certain degree of expected boldness, they understand that they can, if they choose, contribute to the beauty of our urban landscape, though the rest of us don't always appreciate it when it takes the form of, oh for instance, graffiti. 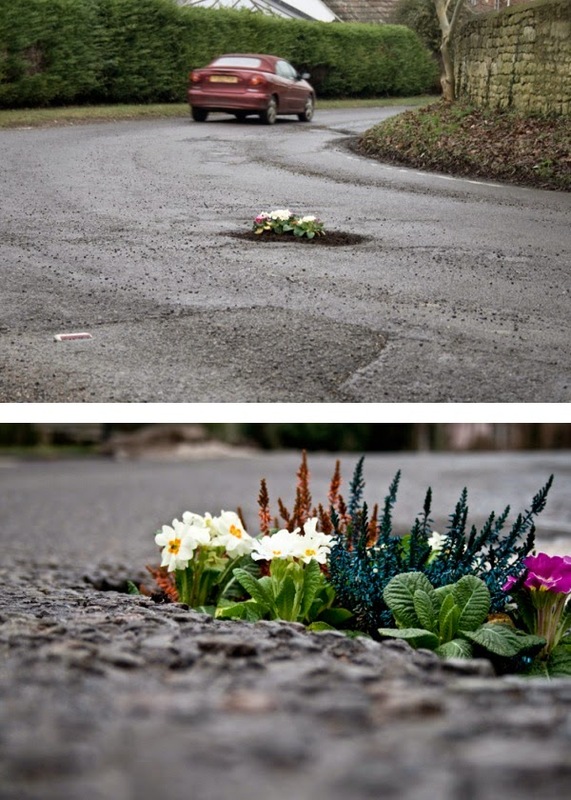 In 2012, Pete Dungey, a British artist, created what he called "pothole gardens" -- little plantings in what are normally eyesores and dangers. It was part of a project he named, delightfully, "Subvert the Familiar," an important role for art. In that same spirit, I noticed and admired this pink and blue striped handle cover that somebody knitted for the Big Belly garbage compactor at the corner of Madison and Wacker Drive. It was not an accidental act. Somebody had to conceive it, create it, and affix it to one of the corporate garbage cans that represent the fire sale sell-off of Chicago's infrastructure. I admired that it was so subtle. It wasn't showy. It was just there. What's the handle's purpose? Hell if I know. To pad and protect the fingers of those throwing stuff away? To look pretty? To get people like me thinking? Something else? I hope there isn't some common, well-known, prosaic explanation. "Geez, Neil, those are the pink and blue knit handle cozies that Girl Scouts have been putting on garbage can handles for years. Where have you been?" I noticed the knit cover on Sunday, on my way into the Lyric to see "The Sound of Music," and instantly quizzed its PR staff, wondering if perhaps it was some Austrian decoration—the trashundrecepticalmittenfruppy—they had put out, in some unfathomable cross-promotion of the musical. No, not them, they said. The subject didn't weigh on my mind. But I did think about it, trucking south on Wacker Tuesday, and was pleased to see it was still there, not a tatter shred, but quite intact. The power of yarn. One reasons we usually don't arbitrarily decorate public spaces is the assumption that our loutish fellow citizens would destroy whatever we do, for the sheer joy of destruction. But the handle remained, at least for two days, perhaps because few noticed it, perhaps because those that did got into the unexpected whimsy of the thing and let it be. I like to think that is a factor. When I wrote the above, I measured the odds of hearing from the person who knit this, decided they were slight, so didn't bother appealing to the public for an explanation. What I didn't realize—duh—is that there are very few isolated expressions of individuality nowadays that can't be immediately slotted into a movement, a genre, a term. In this case, it is "yarn bombing," or ... ready? 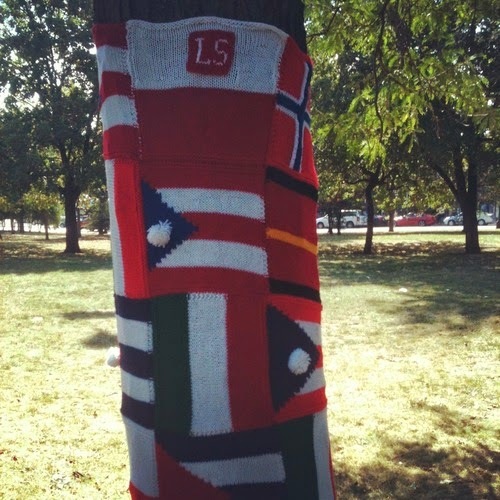 ... "guerrilla knitting," and there are far more elaborate examples to be found around Chicago, such as these at Logan Square. The practice has its own Wikipedia page, which trace the practice back to the 1990s, and shares some clever examples, such as wrapping a tank at a military museum in Germany. I wouldn't mind hearing from a yarn bomber (nice to hear that term given a new meaning) about the appeal, though a very good guess immediately springs to mind. People who knit, who like the physical act of knitting, are faced with the challenge of what to do with the result of their passion. There are only so many loved ones who are willing to accept so many scarves, sweaters, afghans, etc. Thus yarn bombing seems to offer a perfect solution. Takes a lot of knitting to wrap a tree. Plus you get to be artistic and neighborly too. It's called yarnbombing. See Wikipedia for history and photos. I never liked the word "photobomb" and so don't care for "yarnbomb" either. I suppose it's descriptive for a large demonstration. Be that as it may, I think the discovery of a small, isolated act of yarn decorating is more effective, and certainly more whimsical. It's like you alone discovered it, at least for the moment. I have a brother and a son who do versions of this. Their medium is wheatpaste. Many people probably view these as graffiti, but they don't view it that way. These artists all have an identifiable style and subject matter they traffic in (my brother does hearts, my son does these neurotic characters he calls "creeps"). And there are, as far as I can tell, rules regarding where to do this, what you should and shouldn't cover up, etc. Looks to me like this might actually be crocheted and not knit, although I wouldn't want to swear to that without seeing it even closer up. Personally don't have the guts to pull this off, but I think it is tremendous fun. The yarnbomb makes us look twice at something we see everyday. It emphasizes the shape and function of its host and invites us to look around to see what else is there. We have a Yarnbomb Spectacle underway to celebrate the annual Riverside Arts Weekend, conveniently abbreviated RAW. By continually asking ourselves, "What makes RAW raw?" we aim for a high-impact visual experience to complement the festival. This year we threw out the idea of yarnbombing and the results are popping up on lampposts near the village center, train station, and park where the art fair will be held on May 17-18. The yarnbombs are whimsical and colorful. Passersby have called them cozies and sweaters and want to take their picture. Every day a few more appear. All of the yarn was donated and some knitters and crocheters worked on their own while others partnered with friends and neighbors. Girl Scout Troop 657 learned to knit by making one. A local knitting group at Riverside Public Library supported beginners and challenged experts at their weekly Monday evening sessions. I find myself enchanded by "trashundrecepticalfuppy." When stationed in Bremerhaven some years back I labored mightily to achive a rudimentary grasp of the lingo, but the compound words tended to throw me. The only one that sticks in memory is BahnhofStrafsenbahnhaltestelle, which I believe computes to "Streetcar stop by the railroad station."